Mother’s Day truly is a family holiday. Celebrating motherhood and all the wonderful things wonderful mothers do, Mother’s Day is celebrated in a number of countries as spring springs. In the United States, Mother’s Day is celebrated every year on the second Sunday in May. It is a day for family members to treat the mothers in their lives to a special day — and this usually includes a memorable meal, like brunch. Many people believe that brunch is an American creation – but it is not! Brunch actually started out in England during the late 19th century and didn’t become popular in the U.S. until the 1930s. Mother’s Day, however, did start out in the United States. It was first celebrated in 1908, in West Virginia, by Anna Jarvis, who held a memorial for her mother at St. Andrew’s Methodist Church. Why is brunch so popular on Mother’s Day? Brunch is a combination of breakfast and lunch usually served from late morning to early afternoon. This makes it perfect for Mother’s Day because it gives mom a chance to sleep in – hooray! It also gives the rest of the family, including children, extra time to prepare a meal in her honor. Some of the most popular brunch menu items in the United States include: bacon, blintzes, breakfast sausage, cinnamon rolls, egg omelettes, quiche, French toast, ham, hash browns, pancakes, salads, salmon, steak and eggs, muffins and scones. Some of the brunch favorites you’ll see served on Mother’s Day are sugarfree and low-carb, like plain yogurt, sausage and bacon, but many are loaded with sugars, carbohydrate, fat and sodium. The recipes on this page are diabetic-friendly and include enough variety to make dear mom – and the rest of the family – happy on Mother’s Day. They also include the nutritional information you need to plan your diabetic Mother’s Day menu. We hope you find something that works for your family. Make homemade breakfast sausage that is healthier and lighter in sodium and fat. Serve these zero carb sausage patties with your breakfast or brunch – or as part of a breakfast sandwich. You can even make them ahead of time and store in the freezer until ready to use (just thaw and heat in a skillet or microwave). 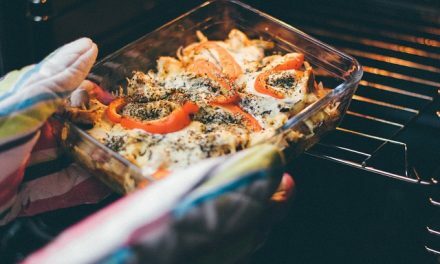 This is a diabetic and keto diet friendly recipe. Place in an air-tight container. Chill in the refrigerator 4 to 24 hours to allow flavors to blend. Shape into 1/2-inch thick patties. In skillet cook patties over medium heat about 4 to 5 minutes on each side, or until done. Alternative Cooking Method: To broil, place patties on an unheated rack in broiler pan. Broil 5-inches from heat about 5 minutes on each side. 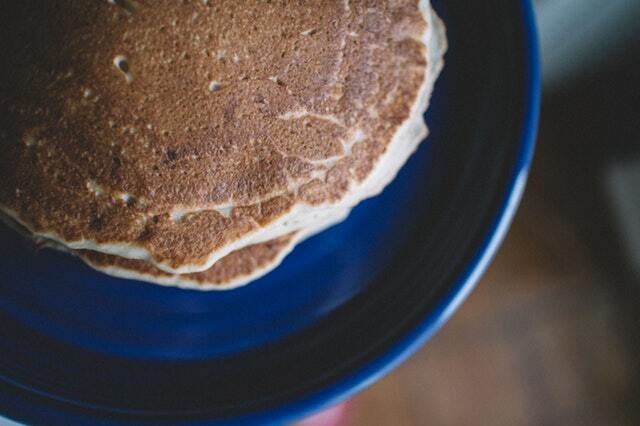 This diabetic-friendly pancake recipe appears courtesy of The New Family Cookbook for People with Diabetes. 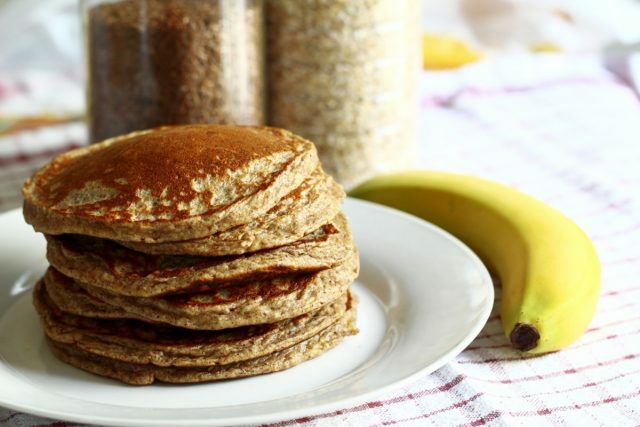 Combine the buttermilk, oats, and bran in a large bowl. Let stand 5 minutes. Add the egg and beat until blended. In a small bowl, mix the whole wheat flour, sugar, baking soda, and salt until blended. Add to the bran mixture and blend until all the flour is moistened. 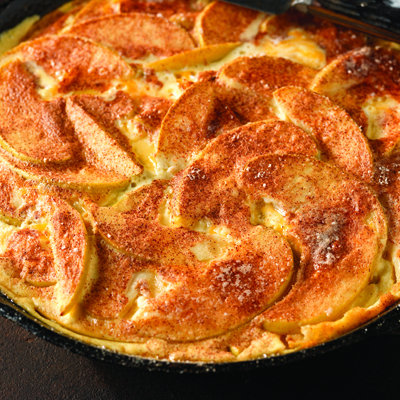 Prepare a hot skillet or griddle with non-stick pan spray. Pour in about 1/4 cup batter for each pancake. Cook about 3 minutes, or until bubbles form on the top and the edges are dry. Turn and cook the pancakes about 2 minutes more. Fill medium saucepan with water and bring to a boil. Submerge asparagus and cook for approximately 2 minutes, maintaining a bright green color and slight crunch. Immediately remove asparagus and shock it in a bowl of ice water. Reserve. Coat medium size skillet with cooking spray. Crack two Eggland’s Best eggs into pan and cook over medium heat until the whites set and the edges of the eggs are cooked. Place asparagus on plate, making an even layer. 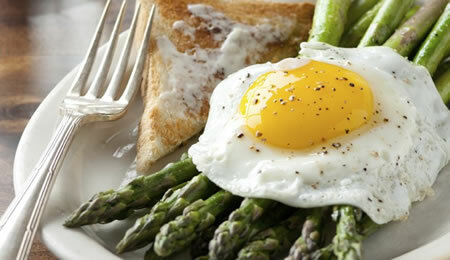 Remove eggs from the pan using a slotted spatula and place on top of asparagus. Top with a drizzle of olive oil and garnish with Parmesan cheese, bread crumbs or red peppers, if desired. Can also be served on two pieces of whole wheat toast. 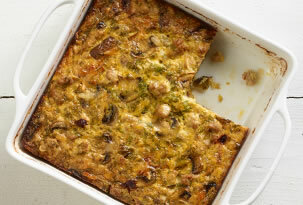 This flavorful egg and turkey frittata recipe will wake up your taste buds. Mist 8 x 8-inch baking dish with cooking spray. Cook ground turkey as specified on the package. Always cook to well-done, 165F as measured by a meat thermometer. Sprinkle with cumin; stir to mix. In large skillet over medium-high heat, add oil, green pepper, mushrooms and chipotle peppers. Cook 5 minutes, stirring occasionally, until mushrooms are cooked. In large bowl, whisk eggs, milk and cilantro until well mixed. Stir in turkey, cheese, mushroom mixture and green onions. Spoon mixture into baking dish. Heat large, heavy nonstick skillet over medium heat until hot. Season beef steak with salt, as desired. Place beef in skillet. Pan-broil 10 to 13 minutes for medium rare (145F) to medium (160F) doneness, turning occasionally. Remove beef from skillet. Set aside; keep warm. Heat oil in same skillet over medium heat until hot. Add eggs and scramble until set, stirring occasionally; keep warm. Carve steak into thin slices. 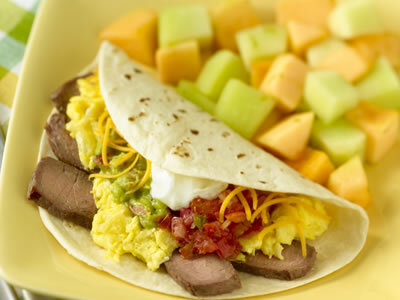 Top each tortilla with equal amounts of eggs, steak and 1 tablespoon each of cheese, guacamole, salsa and sour cream. Serve immediately. Combine egg substitute and milk in a medium bowl and whisk until well blended. Place spinach and basil in another medium bowl; set aside. Heat canola oil in a small nonstick skillet over medium-high heat. Add tomatoes and rosemary, and cook 2 minutes or until soft, stirring frequently. Add to bowl with spinach and basil, toss, and cover to allow spinach to wilt slightly and flavors to blend while preparing omelets. Reduce heat to medium. Wipe skillet clean with a damp paper towel. Coat skillet with canola oil cooking spray and place over medium heat until hot. Pour half of egg mixture into skillet. Cook 5 minutes; as eggs begin to set, gently lift edge of omelet with a spatula and tilt skillet so uncooked portion flows underneath. When egg mixture is set, spoon half of tomato mixture over half of omelet. Top with half of feta cheese. Loosen omelet with a spatula and fold in half. 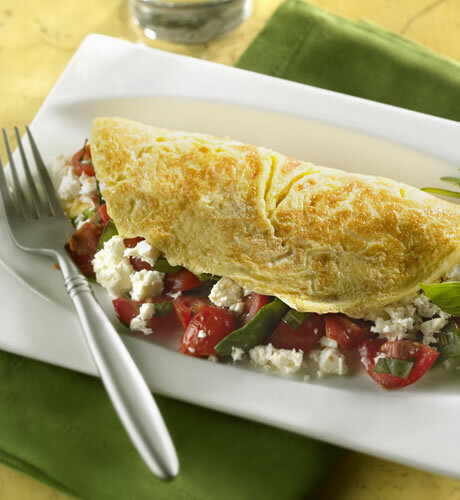 Slide omelet onto serving plate and cover with foil to keep warm. Repeat with remaining ingredients. Recipe Yield: Yield: 4 servings. 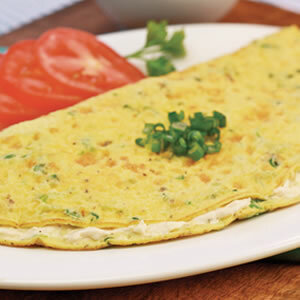 Serving size: 1/2 omelet. Melt 1 Tbsp. margarine in large nonstick skillet on medium heat. Add apples; cook 5 min. or until crisp-tender, stirring frequently. Spoon into 9-inch pie plate sprayed with cooking spray; top with Cheddar. Granulated Sweetener and cinnamon; dot with remaining margarine. Bake 12 to 15 min. or until puffed and golden brown. Tender, cheesy and savory custards in flaky pastry shells make elegant finger food-and can be made ahead and reheated. Delicious for brunch or evening appetizers. On a lightly floured board, roll out the pastry dough 1/ 16-inch thick. Using a 3-inch cutter, cut out 42 circles; re-roll scraps as needed. Fit circles into bottoms and slightly up sides of lightly greased 2-1/2-inch muffin pans. Meanwhile, fry bacon slices until crisp, drain; crumble or chop. Chop mushrooms, saute in butter until limp and liquid evaporates. Combine bacon, mushrooms, green onion and cheese. Divide filling equally among muffin cups. In large bowl, beat together eggs, add sour cream and stir until smooth. Spoon about 1 tablespoon into each muffin cup. Bake until puffed and light brown, 20-25 minutes. Cool in pans 5 minutes; lift out. Serve warm or let cool on wire racks. If made ahead, wrap cooled quiches airtight, and refrigerate overnight. Reheat, uncovered, in a 350 degrees F. oven for about 10 minutes. Recipe Yield: Makes 3-1/2 dozen.Serving size: 1 quiche. 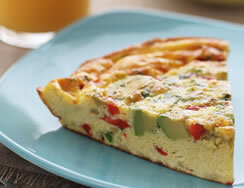 With tons of taste but little fat, this light and luscious quiche is the perfect choice for breakfast, brunch or lunch. Serve with fresh fruit salad. Preheat the oven to 350F. Spray a 9-inch glass pie pan with non-stick spray. Dust the bottom and sides of the pan with the breadcrumbs and set aside. Heat the oil in a large non-stick skillet over medium heat. Add the onion; saute 1 minute. Add the tomatoes and saute until beginning to soften, about 3 to 4 minutes. Remove from the heat and stir in the ham and bell pepper. Spoon into the bottom of the prepared pan. Place the cornstarch, salt and cayenne in a medium bowl; slowly whisk in the half and half to blend. Whisk in the egg substitute and pour the mixture into the pan. Top with the mozzarella. Bake for 40 to 45 minutes until puffed and set. Let the quiche rest for 5 minutes before serving. Sprinkle chopped parsley on top, if desired. Cut in wedges and serve. This light dish is a great choice for lunch or al fresco dinner. It is excerpted, with permission, from The Heart-Smart Diabetes Kitchen: Fresh, Fast and Flavorful Recipes Made with Canola Oil. Steam potatoes and green beans 6 minutes or just until tender. Drain and rinse with cold water, shaking off excess liquid. While vegetables cook, combine vinaigrette ingredients in a small jar, secure with lid, and shake well to blend completely. Set aside 1/4 cup (60 ml) vinaigrette and brush remaining vinaigrette (1 Tbsp/15 mL) over fish. Divide greens equally on four serving plates. Arrange potatoes, green beans, and olives over greens. 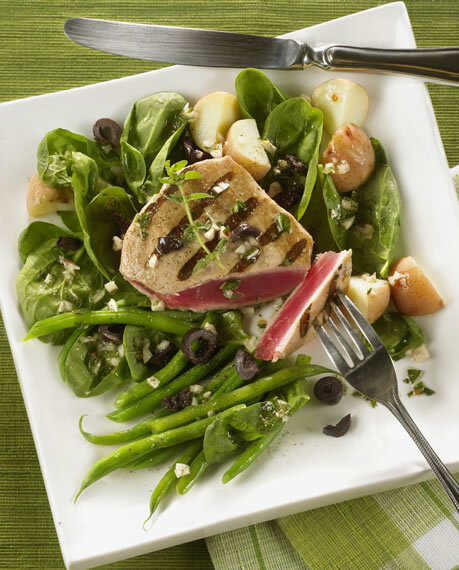 Drizzle 1 Tbsp (15 mL) vinaigrette evenly over each salad and top with tuna. Recipe Yield: Yield: 4 servings. Serving size: 1-1/2 cups (375 mL) and 1 tuna steak. This frittata recipe was provided by the California Avocado Commission and developed by Chefs Mary Sue Milliken and Susan Feniger. In a small mixing bowl, toss together avocado, peppers, garlic, oil, vinegar, salt and pepper. Let marinate 30 minutes. In a separate bowl, whisk together eggs, cheese and parsley until frothy. Season with salt and pepper, to taste. Stir in the avocado mixture. Heat oil in a 10-inch, nonstick, ovenproof skillet over medium-high heat. Add the egg mixture, reduce heat to medium and cook for 7 to 8 minutes, until the bottom is set and the top is still runny. Occasionally lift the outer edges so the uncooked egg can run underneath. Place the skillet in the oven and cook until the eggs are set and golden brown, 6 to 7 minutes. Remove the skillet from the oven and loosen the bottom of the frittata with a spatula. Place a serving plate over the skillet and invert the frittata onto it. Cut into wedges and serve hot or at room temperature. * Large avocados are recommended for this recipe. A large avocado averages about 8 ounces. If using smaller or larger size avocados adjust the quantity accordingly. ** Crumbled goat cheese may be substituted for Spanish manchego cheese. Recipe Yield: Yield: 8 servings. Mix egg substitute, scallions & seasonings in a medium bowl. Bring a skillet sprayed with nonstick spray to medium heat. Add mixture, cover & cook 3 minutes or until set. Transfer to plate, spread wedge over half and fold over. Super simple & delicious! Raspberries and Dijon mustard make a unique combination of sweet and savory. 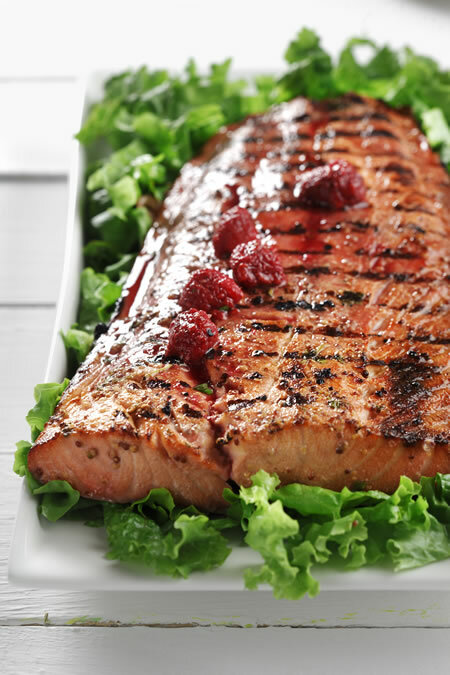 This recipe for Grilled Salmon with Raspberry-Dijon Vinaigrette appears courtesy of Mairlyn Smith. In small bowl, whisk together vinaigrette ingredients. Reserve 1/2 cup and pour remaining 1 cup into resealable plastic bag. Add salmon to bag, seal and place in refrigerator. Marinate up to 30 minutes. Wash and dry lettuce. Set aside. Preheat indoor grill pan or outdoor barbecue to medium heat. Remove salmon from plastic bag and discard marinade. Grill salmon 5-10 minutes or until cooked through, turning once. Mix together reserved dressing with 2 cups thawed raspberries. Set aside. Chop lettuce and divide equally between four plates, about 1-1/2 cups per plate. Divide cooked salmon into four equal pieces and place each piece on top of lettuce. Spoon 1/4 of raspberry mixture over salmon. Garnish with extra raspberries and serve. Safe Temperatures for Foods – Are You Doing it Right?